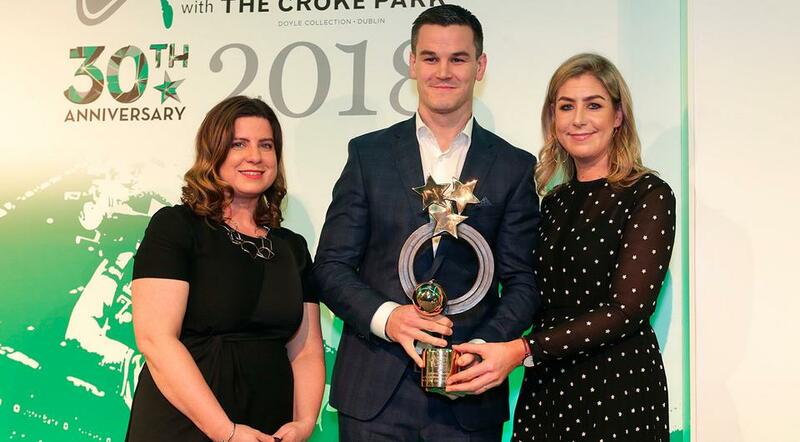 Johnny Sexton said he has “to pinch himself everyday” when he considers his magical year, as he picked up two gongs at the Irish Independent Sport Star Awards 2018 tonight. Sexton, the Ireland Rugby team’s star fly half, won the main Sportstar of the year award at the ceremony at Croke Park. The 33-year-old, who attended the glittering awards ceremony with wife Laura, was also awarded Magic Moment of the year for his incredible drop kick against France in Paris during Ireland’s first game of the 2018 Six Nations. That single moment set Ireland on their way to grand slam victory in what was a remarkable year for Irish rugby. The player, who has already been recognised as World Rugby Player of the Year, said: “It’s been a fantastic year, hopefully 2019 will be just as great. “We dream about seasons like this and you have to pinch yourself sometimes to realise that it’s all happened. The women’s Irish hockey team were recognised with the Team of the Year award after a historic year which saw an Irish female side win a silver in the Women’s Hockey World Cup for the very first time. “The reception we got when we arrived home to Dublin after the World Cup was just incredible and to be invited to awards nights like this, it isn’t something we are used to and it’s lovely. “We are grateful for the recognition and for the growing support of the Irish public. Deirdre,from south Dublin, currently plays for Dusseldorf and is a paralegal but she’s returning home within the coming months to train as a solicitor here and is looking forward to another great year with the team who captured a nation’s imagination. Retired Ireland goalkeeper Packie Bonner was in philosophical spirits for the year ahead as he accepted the Hall of Fame award in recognition of Euro 1988. Packie will always be remembered for his heroic performance for Ireland’s 1-0 win over England in Stuttgart. “Soccer is up there with the great Irish sports and it always will be,” Packie said. “Sometimes you go through periods where you don’t play well but we went through exactly the same in 86 and 87, as we are now and we had great players. “Suddenly Jack came along and then we qualified and our success went on for 10 years. “We had a bit of dip and then Mick came along and we qualified again. “And I have no doubt with Mick taking over we will get back to where we were before. Sarah, a two-time gold medalist from the European under 18 Championships, is currently studying for her Leaving Cert at Holy Child secondary school in Killiney while training. “I ran well and didn’t let the pressure get to me. I’m in sixth year at the moment, so it’s definitely really busy. But running is also a break from school and it’s habit, something I have always done. The awards at Croke Park were attended by an array of professionals from across an array of sports.